Feature Request: Would you add a feature to display any NWS severe weather watches and warnings over the US.? I frequently use the CAPE.feature but that only displays the areas threatened by severe weather in general. Severe weather watch/warning boxes would be a nice addition. It would display areas where actual severe weather is occurring. I did some research and found the National Weather Service (NWS) produces severe weather data in ATOM and CAP format as well as a RSS feed. You can find information on https://alerts.weather.gov. It's been awhile since I did any kind of website programming so most of this was over my head. This information would likely be limited to warnings in the USA and not worldwide. There may be some information regarding hurricanes/typhoons and tsunamis. I hope this helps. I have to finish some features (1-2months) that will make Windy again a little bit faster. Sorry for the delay following up on the severe weather alerts suggestion but I am home recuperating from a hospital stay now. Nothing serious only chronic. I have been trying to understand what the National Weather Service (NWS) RSS feed means and I don’t understand what information you would need so you can add NWS watches and warnings to Windy. My understanding of what the NWS sends is a coded line in XML format which you can use to post the watch and warning boxes. Then again I don’t know what XML actually looks like, ha ha. Is this XML? Is this useful for creating an image on Windy? There usually is a long list of statements, watches and warnings on https://alerts.weather.gov/cap/us.php?x=1 but most of them would not be worthy of displaying on Windy. I would think that Tornado Watches and Warnings, Severe Thunderstorm Watches and Warning and perhaps Flash Flood Warning could be displayed. That would mean you would need to write code to filter out other types of statements listed on the alert web page. There are Flood Warnings, Rip Current Warnings & Special Weather Statements which often contain Marine Weather or High Surf/Coastal Waters Warnings also. What I need to know first is whether the Message above is XML and if not could you give me an example of XML so I can research more for you. I have asked @TomSlavkovsky to look at the similar alerts in Europe. Will be good feature. Right now we have to set up priorities somehow. Hi Diego. We are about to start do this Warning feature. 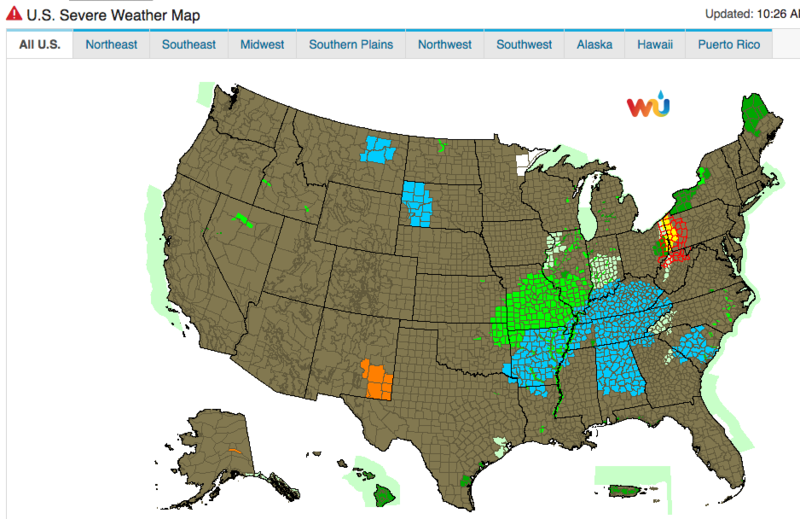 Can you check the NOAA servers for us if there is some aggregate page with all valid warnings for US? The NWS RRS feeds not only include severe weather but also world-wide tsunami information, hydrology reports, fire weather forecasts, storm reports and much more. So filtering out which ones you want on Windy will be a lot of work. If I was in the eastern portion of the US, flood and other severe storm warnings would be most important due to Tropical Storm Cindy. But I’m on the US west coast so today I am interested in fire weather reports and information about our unprecedented early heat wave. FWI: While I live closer to the Pacific coast and the cool Pacific water temps (around 60F or 15C) moderate my air temperature, less than 100 miles east of me (160 km) areas are experiencing incredible heat sometimes exceeding the all time record high temperature ever recorded in a location. For the last week, areas have been experiencing 120F to 125F temperatures daily (48C to 52C). There is no relief in sight. I mention all of this to explain that deciding what and what not to publish on Windy will be a chore. I usually have time daily to research things like this so if you need more, just ask. I won’t always understand what the data means (I don’t know XML - yet) but I can research find websites which may be helpful to you. I’m suffering from some health issues and am basically living in a nursing facility so having something to do is actually helpful to me and my state of mind. Just ask and I will try my best to help. I used to have my own weather station and a fairly sophisticated website displaying all sorts of weather information and you and Windy have stirred my interested in making a website again.